In this episode we start a two-part special looking at ethical issues in robotics. Given the broad and controversial nature of this topic, we will speak with two world-renowned experts in ethics with often-opposing views. Our first guest, Noel Sharkey is Professor of Public Engagement, Artificial Intelligence and Robotics at the University of Sheffield in the UK. Our second guest, which will be featured in our next episode, is Ronald Arkin, the director of the Mobile Robot Lab and Associate Dean of Research at Georgia Tech in the US. Both researchers discuss issues such as military robots, robots in the society, medical robots and legal responsibilities. Their opinions on these subjects have been widely covered by the media, international organizations and academia. The interviews were recorded individually and both researchers were asked the same questions. 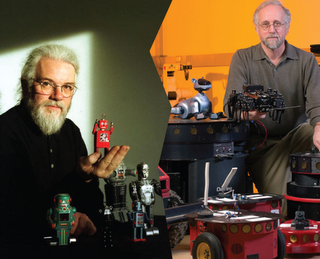 Noel Sharkey is Professor of Artificial Intelligence and Robotics at the University of Sheffield in the UK. Sharkey has been one of the pioneers of robotics from its earliest days, having moved across fields, from philosophy to engineering, psychology and AI. He’s appeared in numerous international television shows, organized robot competitions for young people around the globe, and is the editor for several major journals in robotics. Sharkey also runs his own radio show called Sound of Science, in which he tries to make science accessible to everyone. In his additional role as Professor of Public Engagement Sharkey’s job is to inform politicians, various public bodies and national and international organisations about ethical problems that may arise in robotics. He is a constant presence in international media when the topics of robotics in the military, policing, child and elderly care crop up, and has recently been interviewed in a parliamentary podcast. The debate on robot ethics is not over! Be sure to listen to our next episode in which we speak with Ronald Arkin who presents a very different perspective on the ethical issues in robotics. including an upcoming webcast about the remote controlled beetle, sale of your robot Doppelgaenger and a video of the desktop robotic arm visit the Robots forum!